Development in digital photography has increased the resolution of photo taken dramatically. Most photographers surely have quite a large number of pictures that occupies significant space on the hard drive. To gain back some spaces, the user would have to selectively remove some pictures. The user now has an option, i.e. by reducing the file size with Picture Reduce Wizard. 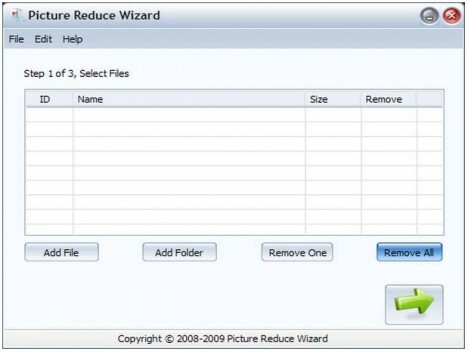 Picture Reduce Wizard is a small tool that help user to resize and shrink pictures in order to fit a very crowded hard drive or just for safekeeping in a smaller size. It comes with an easy-to-use interface that will guide you through a series of steps in order to compress the pictures with minimum loss of quality. Meanwhile, it leaves a very small fingerprint on the system’s memory, i.e. only 9 MB. Picture Reduce Wizard includes the ability to batch resize pictures, batch resize image, and perform batch photos resize functions. You can process thousands of files in a few seconds. The resizing allows you to force a specified width or height and keep the proportions, or define fixed image size. The application supports multi picture file formats including JPG, BMP, GIF, JPEG, PNG, TIFF, WMF, EMF etc. And it can convert the file format to JPG or JPEG. The application is released for free download under the demo license, which means that you can take advantage of all its functionality, with the setback of a watermark is added to the shrunken pictures. The only inconvenient would be the absence of a preview window, feature covered in the Picture Reduce Wizard Pro version. The price for this small tool is a little high at $39. Compresses pictures by level (for example, level 0 means the smallest file size and the poorest quality; 100 means the largest file size and the best quality). Compresses pictures to a certain size (for example, less than 100kb). Resizes pictures to the percent of the original ones (for example, 50% of the original picture). Resizes pictures to a certain width and height (for example, width 320, height 240). Supports multiple formats, including BMP, GIF, JPEG, PNG, TIFF, WMF and EMF.